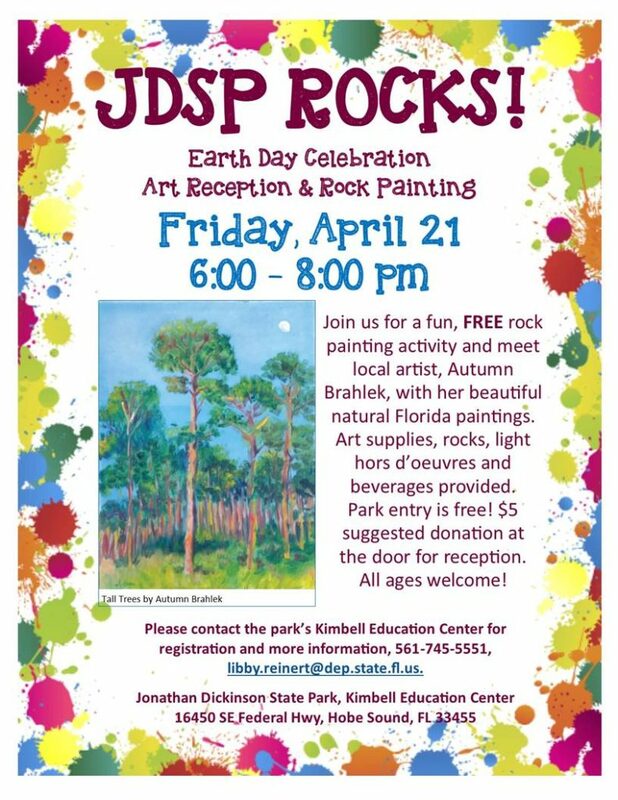 The Friends of Jonathan Dickinson State Park invite you to an Earth Day celebration with local artist and painter, Autumn Brahlek. All ages welcome for this fun, free rock painting activity and opening reception. Art supplies, rocks, light hors d’oeuvres, and beverages provided! Park entry is free. $5.00 suggested donation at the door for reception. Please contact the Kimbell Center for registration and more information, 561-745-5551, libby.reinert@dep.state.fl.us. Autumn’s beautiful natural Florida paintings will be on display in the Kimbell Education Center in the park through Sunday, May 7.